LOS ANGELES (CelebrityAccess) “Concert for George” a star-studded documentary of Eric Clapton’s 2002 memorial show tribute to George Harrison kicks off a theatrical run this week beginning Feb. 20th as it also arrives on home video. The film, presented by Abramorama in association with Concord Music, is being shown in more than 100 theaters across North America. The film event takes place on the eve of Harrison’s birthday. He would have been 75 on Feb. 25th. 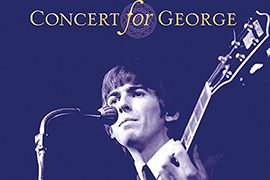 The remastered 5.1 stereo “Concert for George” is available in several formats, including a deluxe limited-edition box set. Along with the limited-edition deluxe box set, “Concert for George” is available in four-LP box set (on vinyl for the first time), a CD and DVD combo pack, a CD and Blu-ray combo pack, and a two-CD set. A limited-edition digital, complete with cuttings from the hand-painted tapestry that was used as the show’s backdrop, has already sold out. All profits from concert product sales will be donated to the Material World Charitable Foundation, which Harrison founded in 1973.